Costabella is a nice quiet beach resort only 10 minutes drive from Mactan international airport. 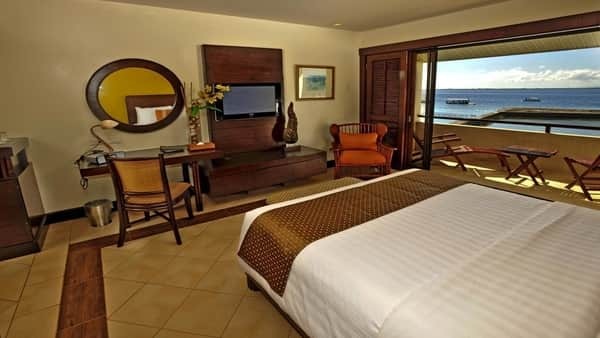 Its 4 star status and excellent level of service have made it one of the most popular resorts on the islands for many years now. 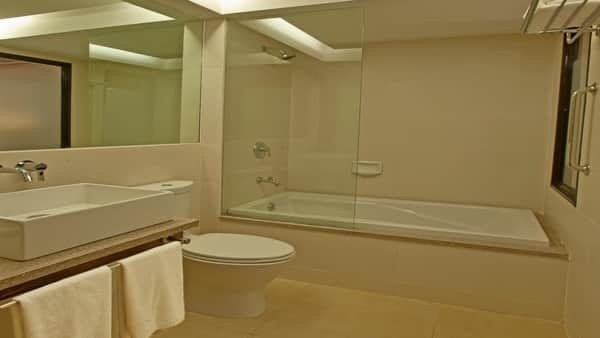 Despite its popularity, Costabella maintains extremely competitive rates, and is one of the best value for money choices in Mactan. With free activities and babysitting service, it’s also by far the most child friendly resort on the island. With 2 swimming pools, a private beach area and 3 restaurants, Costabella really meets the definition of all inclusive. 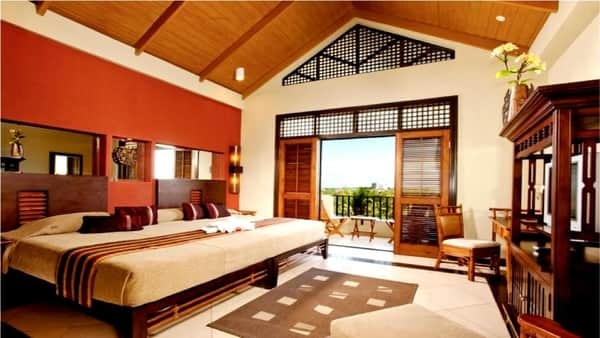 On top of that, it also offers an in-house spa and a gym, as well as a wealth of activities and entertainment options for kids and adults alike. 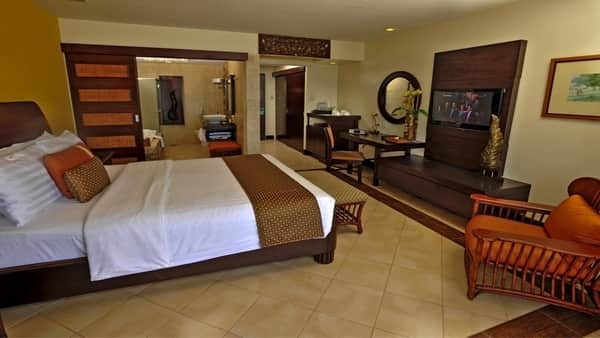 All that makes this resort a great choice for both couples and families, who wish to enjoy a relaxing experience at an all inclusive resort, without paying too much. The standards of service have always been one of Costabella's strong points. Their staff is very friendly and accommodating, and always willing to assist with special requests and help solve any complaint immediately. The whole resort is clean and well maintained. The gardens help create a peacful and romantic atmosphere, and the pool and beach were always clean and tidy. 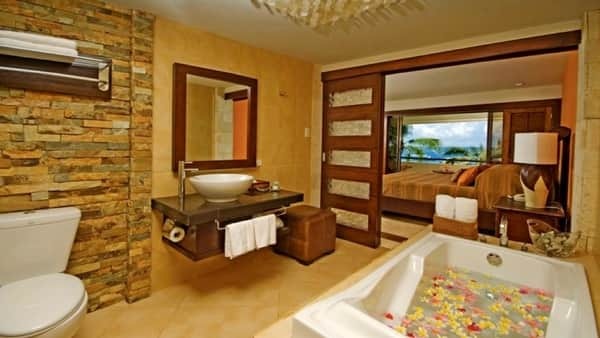 If there's one thing Costabella can improve, it's their rooms. 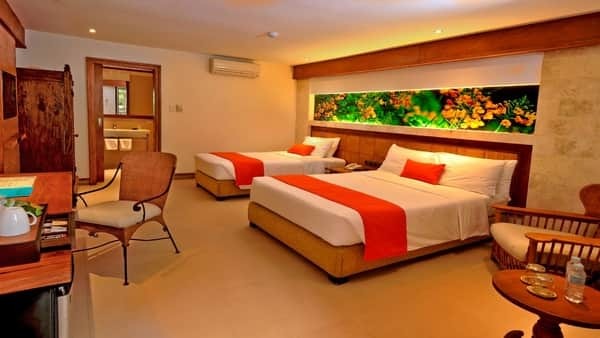 Even though most are spacious and clean, the furniture is a bit old and we experienced some problems with the AC and WiFi connection in the more basic room types. The 2 swimming pools are large and clean, and one even has a slide so they are great for families. The beach is underwhelming, like most Mactan beaches, and is mostly enjoyable in the mornings during high tide. A bit far off the central area, you'll need to grab a taxi or a tricycle if you want to go grab a drink somewhere or eat outside. For that reason, Costabells is most recommended for people who don't mind spending time at the resort. Great all inclusive service at very affordable rates. Costabella keeps a stellar reputation for years now, so consistency is guaranteed. Once you get through the lobby and reception area, the first think you’ll notice is the impressive pool compound. When we got there it was pretty full, with lots of families and small kids running around everywhere and having fun. 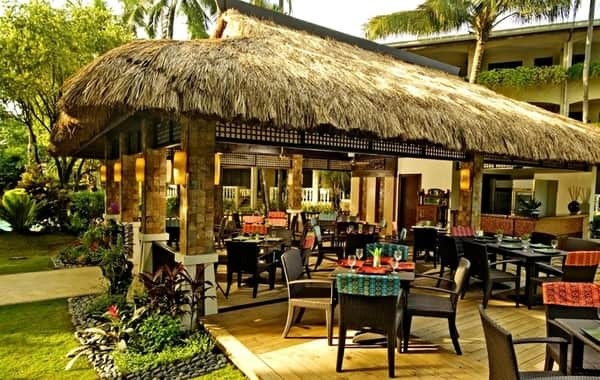 There are beach beds spread everywhere, and a restobar is located right next to the pools – so it’s a great place to rest for a while during the day. We were lucky enough to visit Costabella in the morning, so we could see their private beach in all its glory. From what we understood, it’s far less impressive during low tide though. That said, when we were there it seemed like one of the best beaches in Mactan to be honest. The only thing we didn’t like is the fact the whole beach and swimming area is surrounded by a concrete promenade – which make the whole thing look a bit less natural. The swimming area right next to the beach leads to the house reef, where you can snorkel and see many corals and fish. Kayaking is also possible, as well as many other aqua activities such as jet skis, banana boat and parasailing. If you want to try these, you’ll have to notify the staff in advance and an extra charge will be made to your room. As mentioned, the beach itself was large and full of clear white sand. There are beach chairs and tables spread all around, and the whole vibe is very comfortable and relaxed. There’s also a floating platform at the end of the swimming area, where you can lay down to take a rest and sunbath. This is especially useful during low tide when the waters are far and the beach isn’t as nice to stay at. Costabella resort has 156 rooms, out of which more than half can be considered poolside. 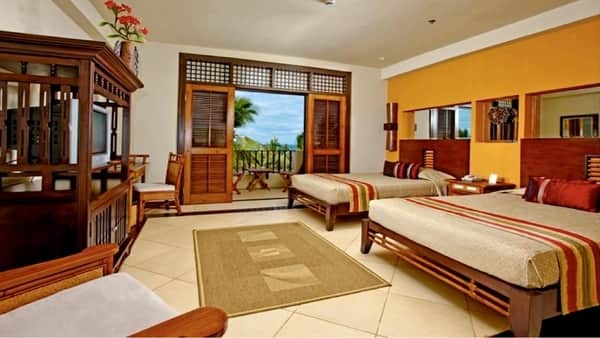 Only a dozen or so rooms are by the beach, and all are suites type and naturally more expensive. 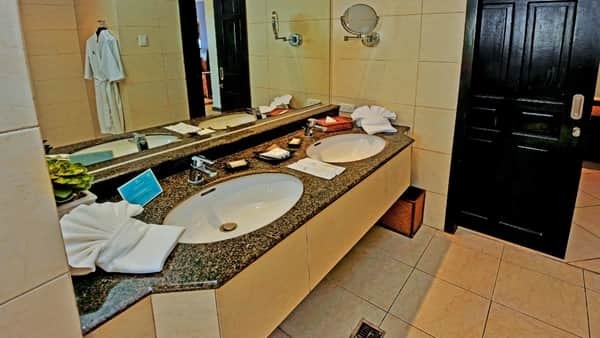 Rooms are larger than what you’d normally get in Mactan, but they some of them could use a bit of freshening up. Some mattresses are old, WiFi signal is lagging and the AC isn’t the strongest. On the plus side, whenever one of our clients had an issue the staff was extremely helpful and a new room was arranged promptly. 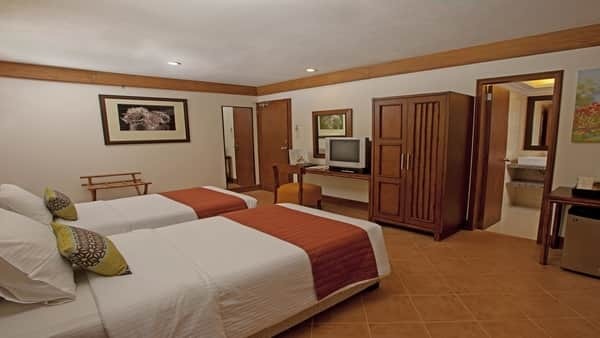 All rooms are equipped with a TV, air conditioning, a fully stocked mini bar, and a hot/cold shower. 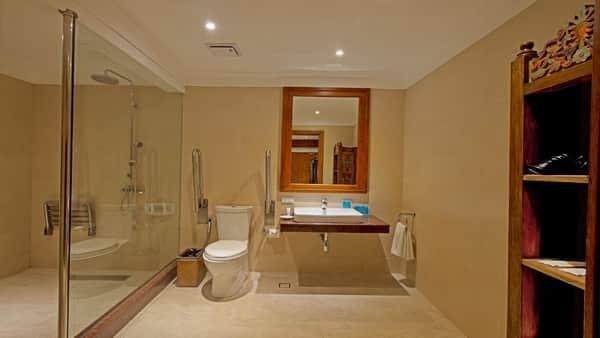 Water pressure can be better, but overall the shower is the most consistent element in the rooms at Costabella. 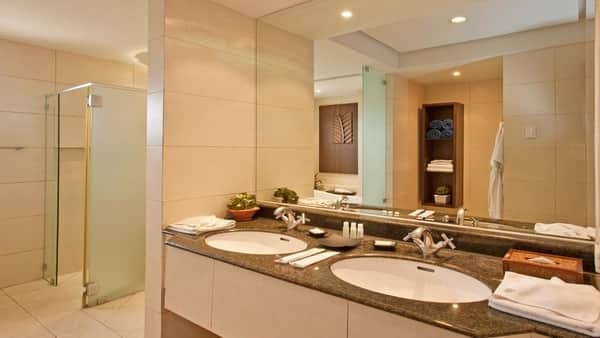 Shower and toilet amenities are always available, and can be restocked immediately upon request. 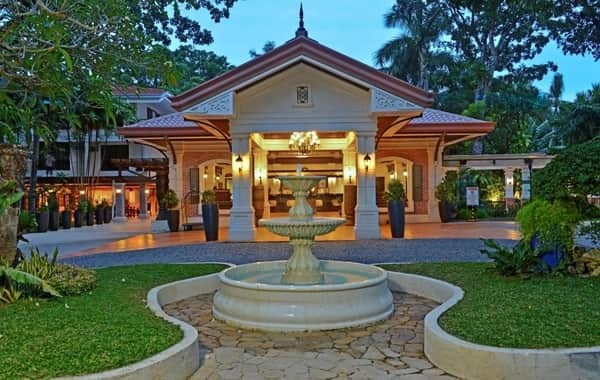 Since Costabella is one of the very few resorts in Mactan who offer rooms at a sensible price, the crowd there is very diverse. 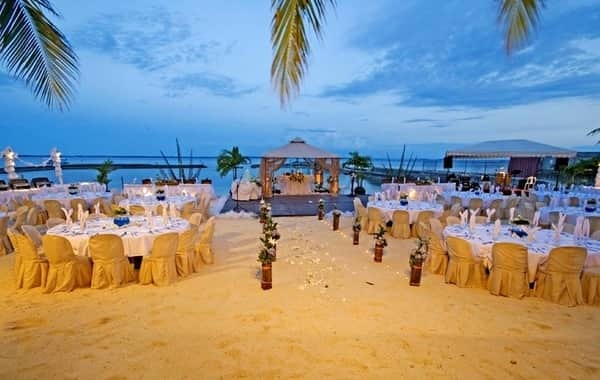 The resort attracts a lot of local tourists who look to have a cheap island vacation with their families. On top of that, due to its popularity there's an endless amount of reviews online, and it's important to understand which ones are truly relevant. 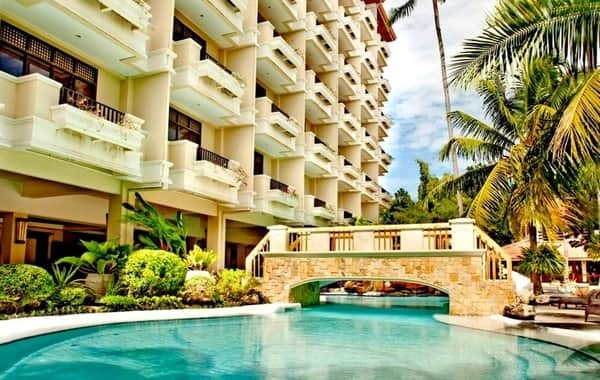 Tripadvisor has 719 reviews of Costabella, with an average score of 4, placing it as the 9th best ranked resort in Mactan out of 43. reviews are mixed, but overall only 8% of guests rated their experience at the hotel as "below average". 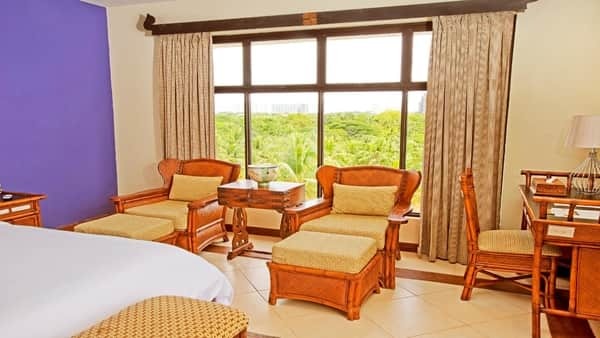 Most complaints were directed towards the comfort of the rooms and many guests felt they were too old and poorly maintained. The pool and breakfast received the most praise. 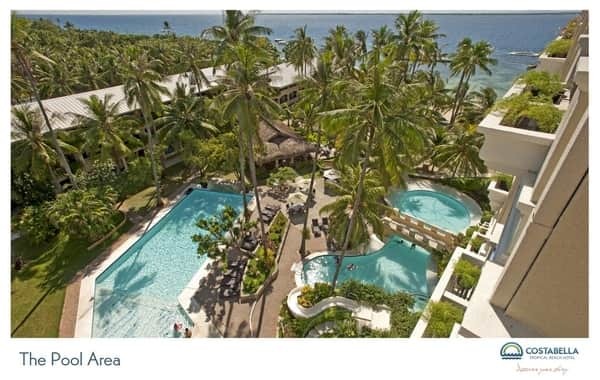 On Booking.com there are 1420 different reviews with an average score of 7.9, which is one of the highest among Mactan beach resorts. Guests really liked the pool and various water activities, and praise the friendliness of the staff. Most complaints we found were regarding the beach area, and the poor WiFi signal inside the rooms. The majority of reviews are written on Agoda.com, with no less than 1799 guests providing feedback. Costabella gets a score 7.6 making it a "Very Good" choice for your accommodation.. Agoda users really liked the all inclusiveness vibe of the resort, as well as the food served there. Complaints are mostly about the slightly remote location, and the relatively slow check in process. One of Costabella’s strong points is its wide area of dining options, all providing excellent quality. The main restaurant is La Maria, where the breakfast buffet is served. It’s located at the center of the resort, right next to the swimming pool, and it won’t take you more than a minute or 2 to reach. It serves a mixed assortment of dishes, with the focus being Malay and Chinese cuisine. Breakfast is included in the room’s price, and La Marina is open 24/7. The second restaurant is the Brisa, located right next to the pools. It offers a mix of Asian delicacies and is open between 11am and 11pm. Lastly, there’s the Luna tapas bar, which can be found right behind the lobby if you are coming from the pool area. This nice and cozy bar is a great place to enjoy a drink before going to sleep, while eating some delicious tapas dishes. 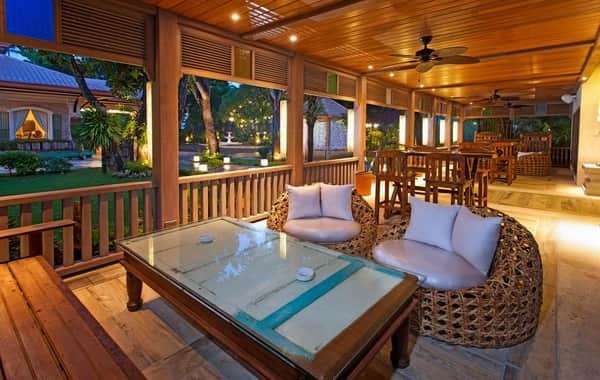 If you don’t mind the hot weather, grab a sit at the veranda and enjoy a nice view of the entire resort while you relax after a long day. Another key feature at Costabella, which really sets it apart from most other 4 star resorts, is the amount of available activities and attractions. It’s fair to say there’s always something going on at the resort, and you are always welcomed to join in on the fun. While we didn’t have a chance to test this activities ourselves, we did receive fantastic feedback from people we sent and had a wonderful time. 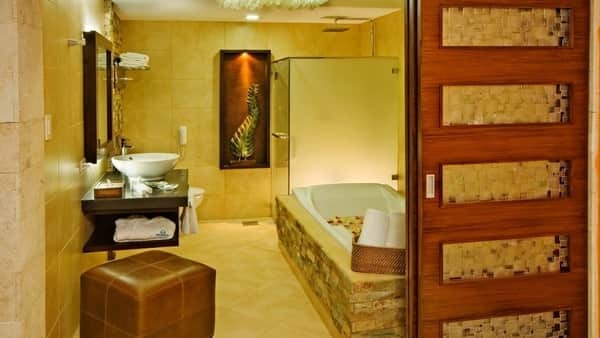 The resort offers an inhouse spa which operates between 9m and midnight every day. The prices are absolutely fair, at least compared to the standard we became used to at other resorts. More importantly, the service is excellent and the place is very clean and well maintained. Don’t be fooled by the old style and the fact it’s a bit too dark – you gotta give their treatments a try. 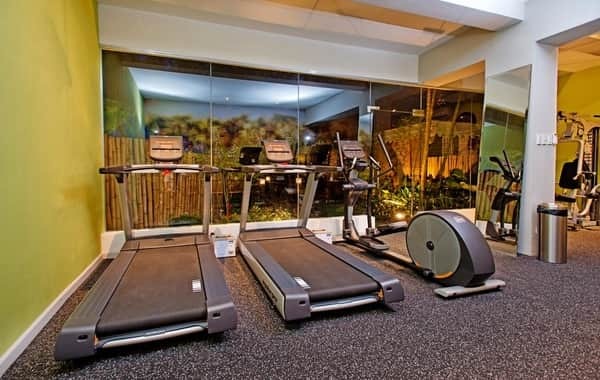 There’s also a gym available, which is spacious and fully functional, even if it’s not the most impressive we’ve seen. Lastly, you can also check out the game room, where an assortment of games such as pool, darts, table tennis and board games are available. 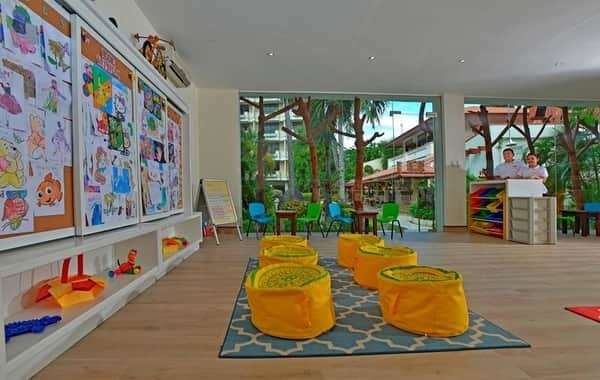 Another great feature for families is the Kiddie Korner – open between 10am and 5pm and providing babysitting and entertainment for kids between the ages of 4 and 10. this service is FREE for hotel guests, and supervised closely by trained staff members. The kids enjoy various activities and games, the kiddie pool and Kiddie arts & play time. It’s a very nice way to make sure your kid has a great time, while you get a chance to enjoy the pool or relax at your room. The fun at the resort doesn’t when the sun sets. 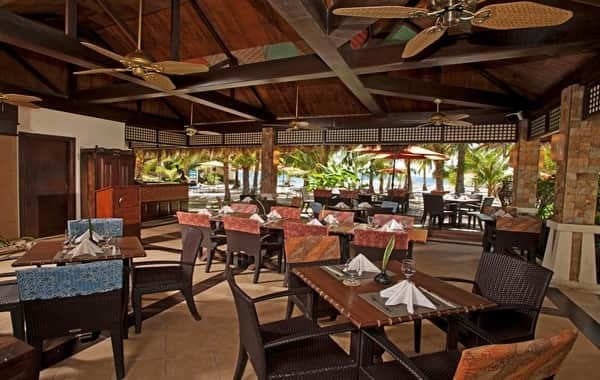 A live show is available every night between Monday to Saturday at the La Marina restaurant between 6 and 10pm. At Sundays, the show is moved to the Birsa – where you can enjoy live music while sipping a cocktail by the pool. On top of that, the staff occasionally organizes cultural shows and other fun guest activities. To sum it up, Costabella is a great all inclusive resort which provides everything you need in order to have a great time. It’s a perfect choice for families with young children, but also to couples who wish to enjoy it’s remote location and relaxing atmosphere. 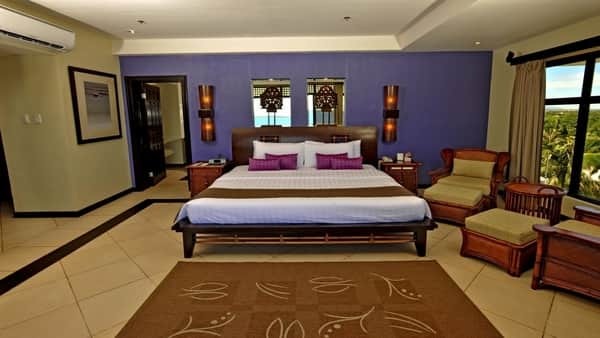 When you take into account the price, you realize why we rate this resort as one of the best 4 star options in Mactan. 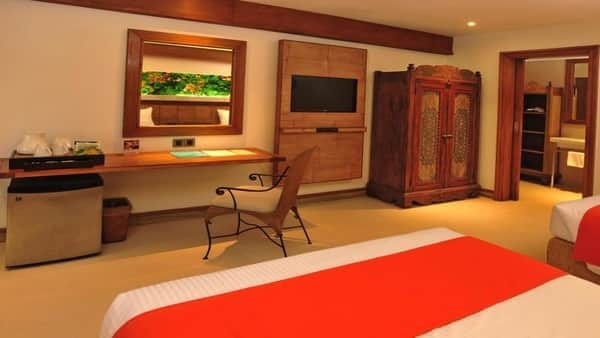 This is the most basic room type offered by the resort, and it’s only 20 sqm large. 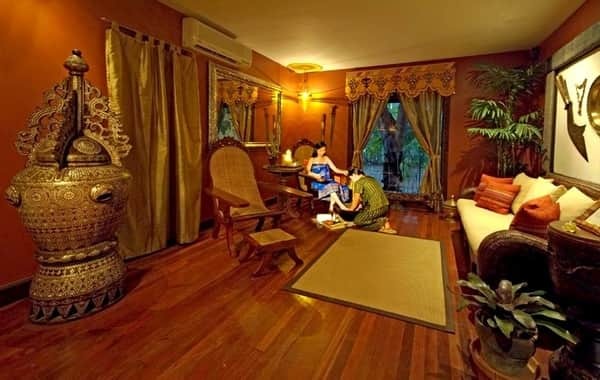 Still it can accommodate 2 adults and a child pretty comfortably, and has 1 queen size bed and 1 single. 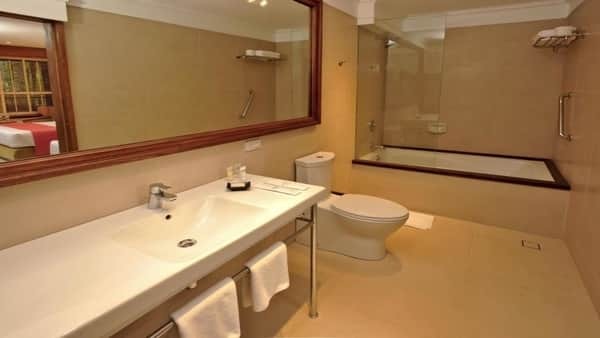 There are 2 types of Deluxe rooms – the Deluxe and the Premiere Deluxe. 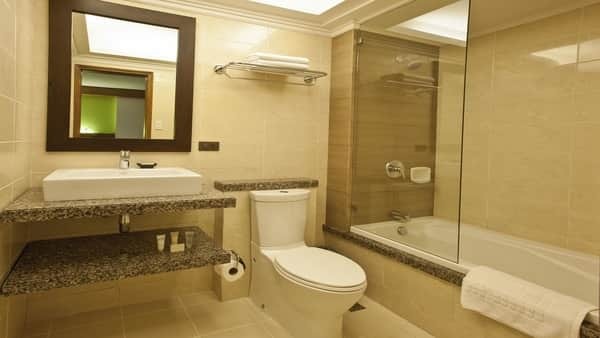 Both are located right next to the pool, and offer a fully furnished space of 24 and 36 sqm respectively. 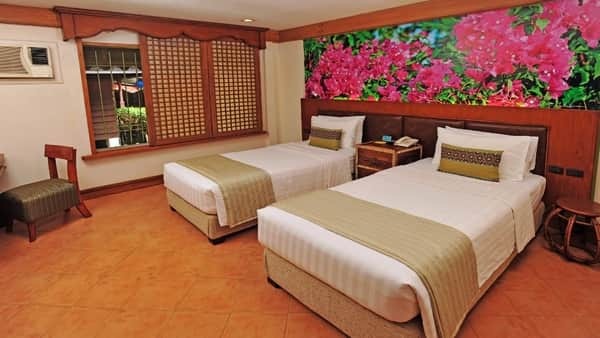 While they are both good for 2 adults and 2 kids, the regular deluxe have 1 queen size and 1 single beds, while the Premiere deluxe has 1 king sized bed and 1 single. 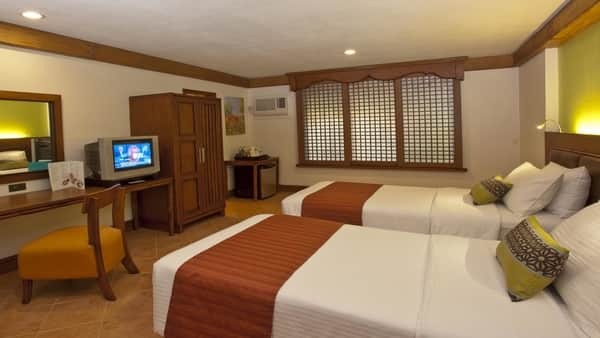 While this room isn’t huge at just 31 sqm, it offers people who stay there the best possible location in the resort. 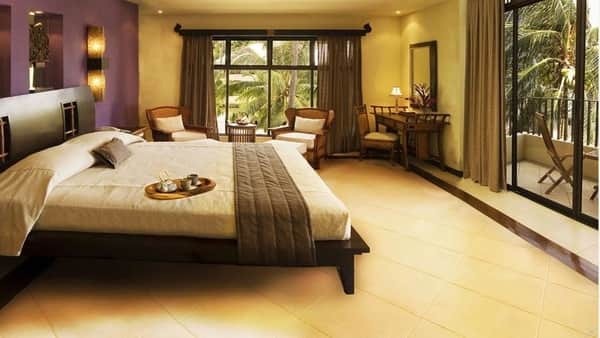 You’ll only be 2 meters away from the beach, and approximately 50 meters from the pool. 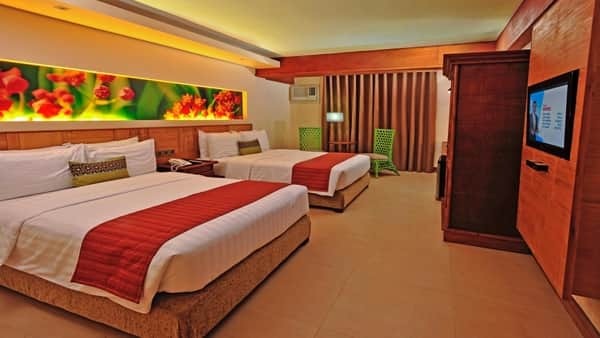 The room comes with 1 queen size and 1 single bed, and can accommodate 2 adults and a child. 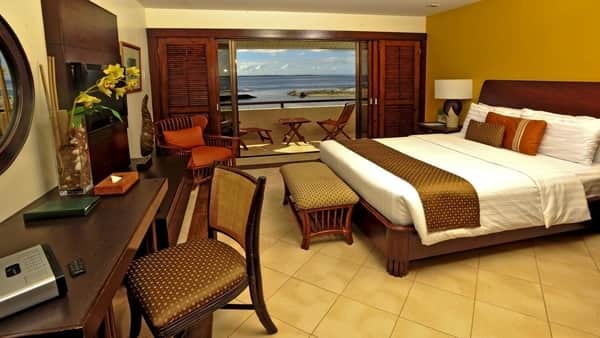 The seafront suites are the resorts best rooms, and there are only 4 of these available at the moment. It’s a large 86 sqm villa, with a living area and 2 separate bedrooms. 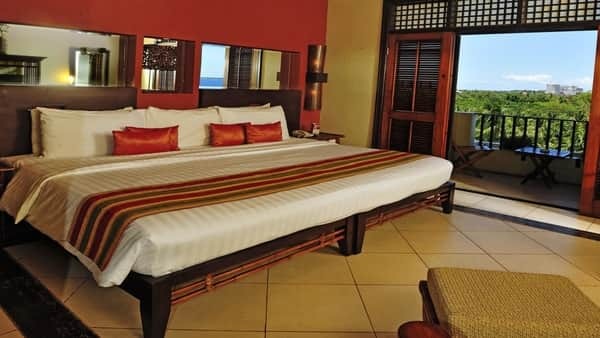 This suite can accommodate up to 4 adults and 2 children and is located right next to the beach.